We deal with assembled mini projects. This is a light sensitive trigger based on NE555 timer IC, that can be used to automatically turn on devices like outdoor lightings. When the light intensity falling on this LDR sensor reduces, the connected device will turn on. So, when the sunlight reaching the Light Dependent Resistor (LDR) descreases, as evening falls, the relay will automatically turn on the connected device. You need to put the connected light bulb far from the sensor, so that the bulb light does not interfere with the operation of this device. 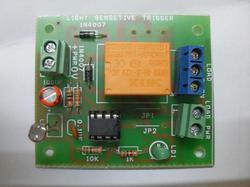 For example, this device can be mounted inside the electrical control box/switch for the outdoor lightings. Make sure, the sunlight reaches the LDR to switch off the connected device in the morning. 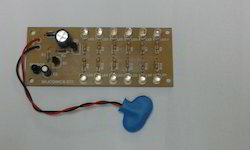 This smoke alarm uses infrared opto interruptor type MOC 7811 as sensor.This four leaded module contains an infrared LED and a photo transistor.Oscillator circuit is wired around popular I.C.555.Collector terminal of sensor is connected to pin 4(reset)of I.C.555.So in the abscence of smoke gap of sensor is clear.Then light from I.R.LED will fall on photo transistor.Then reset pin of I.C 555 is held low.Then alarm does not sound.When smoke is present in the gap of the sensor the light beam from LED to the photo transistor is obstructed.Then alarm is activated. 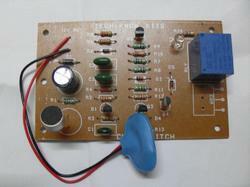 Sensitivity of smoke alarm can be adjusted by variable resistor.Supply voltage is 6 to 15 volts for demonstration a 9 volts battery can be used. Simple water level indicator PCB with buzzer .